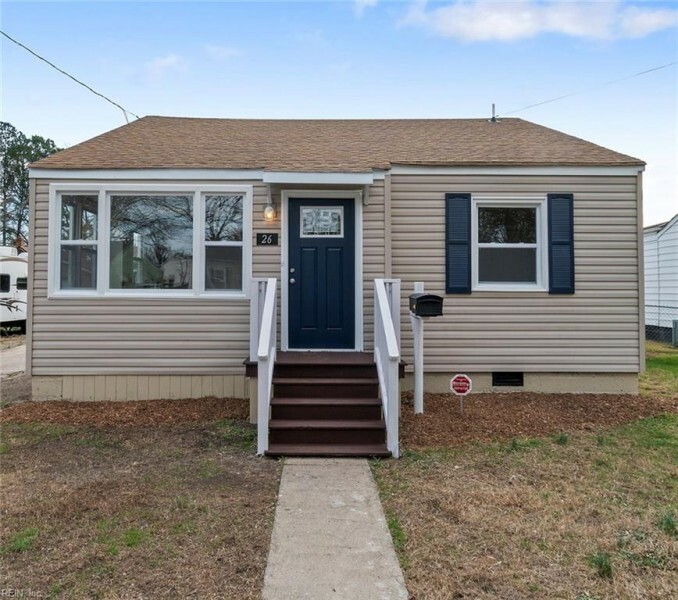 YOU DON’T WANT TO MISS THIS IMPECCABLY RENOVATED HOME! INSIDE, THIS STUNNER HAS THE ELEGANCE OF A HIGH-END HOME, WITH EVERY DETAIL CAREFULLY CONSIDERED, AND ITS OPEN FLOOR PLAN MAKES IT FEEL SO SPACIOUS. THE KITCHEN HAS LOVELY GRANITE WITH A STYLISH BACKSPLASH, AND UPGRADED CABINETRY, WHICH IS ACCENTUATED WITH STAINLESS STEEL APPLIANCES, AND AMPLE COUNTERSPACE. THE DEN IS BRIGHT AND AIRY, AND THE GORGEOUS BATHROOM HAS A DOUBLE VANITY, AND ELEGANT TILEWORK. THE ENTIRE HVAC SYSTEM (INCLUDING ALL DUCTWORK) HAS BEEN REPLACED, AND THERE ARE NEW DOORS AND WINDOWS THROUGHOUT. THERE IS AN OVERSIZED DETACHED GARAGE / WORKSHOP, AND THE PRIVATE, FENCED BACKYARD HOLDS AN ADORABLE SHED THAT MATCHES THE HOME AND GARAGE. NESTLED ON A QUIET STREET WITH EASY ACCESS TO INTERSTATES, BASES, DOWNTOWN, SHOPPING, AND DINING… YOU WILL WANT TO BE PART OF THE ENERGY/REVITALIZATION OF THE HISTORIC CRADOCK COMMUNITY! Ready to visit 26 Rodgers? Request a free property tour! Send me more information about the listing at 26 Rodgers, Portsmouth, VA 23702, MLS# 10239444. This 3 bedroom, 1 bathroom home located at 26 Rodgers, Portsmouth, VA 23702 has approximately 918 square feet. It is currently listed for $130,000 and has a price per sqft of $14,161. This home is currently Sold under the MLS#: 10239444. This listing is provided by The Real Estate Group. 26 Rodgers Place, Portsmouth was built in 1941. It has Garage Det 1 Car, 3 Space, Driveway Spc parking.The kitchen includes Dishwasher, Disposal, Dryer Hookup, Microwave, Elec Range, Refrigerator, Washer Hookup. 26 Rodgers is part of the Cradock Gardens neighborhood located in 23702.